In particle simulations, the weights of particles determine how many physical particles they represent. Adaptively adjusting these weights can greatly improve the efficiency of the simulation, without creating severe nonphysical artifacts. 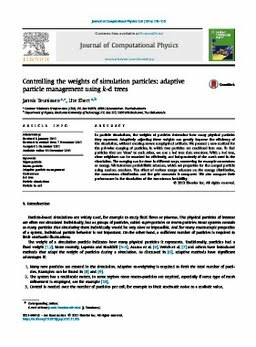 We present a new method for the pairwise merging of particles, in which two particles are combined into one. To find particles that are ‘close’ to each other, we use a k-d tree data structure. With a k-d tree, close neighbors can be searched for efficiently, and independently of the mesh used in the simulation. The merging can be done in different ways, conserving for example momentum or energy. We introduce probabilistic schemes, which set properties for the merged particle using random numbers. The effect of various merge schemes on the energy distribution, the momentum distribution and the grid moments is compared. We also compare their performance in the simulation of the two-stream instability.